Karen Kingsbury’s new book asks the question: What Would You Sacrifice For Fame? 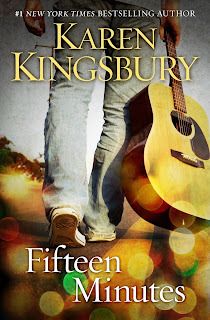 (Synopsis from Amazon.com) Zack Dylan made a promise to God and his college sweetheart as he left his family’s horse farm in Kentucky to compete on the popular reality television show Fifteen Minutes: If he makes it, the fame won’t change him. Overnight, Zack is the nation’s most popular contestant, a country singer with the looks and voice of a young Elvis. As his star rises, Zack is asked to compromise and quiet his beliefs, and also something more. Something Zack could never have imagined. Just as America is falling in love with Zack, just as he’s on the verge of winning it all, his choices lead him to the brink of personal disaster. At the same time, Reese Weatherly, a therapeutic horse instructor, is no longer sure about her relationship with Zack, or the wedding they had dreamed about. While Zack advances from one round of the competition to the next, an offer comes to Reese—one that will take her to a home halfway around the world. Then Chandra Olson—reigning diva pop star and one of the Fifteen Minutes judges—intervenes. Chandra has suffered so much public pain and private agony since her days as a Fifteen Minutes contestant. Now she wants just one thing: meaning. Can Chandra’s private losses help Zack find his way, or will his fifteen minutes of fame cause him to lose the life he once loved? Fifteen Minutes is a story of character, compromise, and the cost of having it all. A story that raises the question: Who are the real winners? 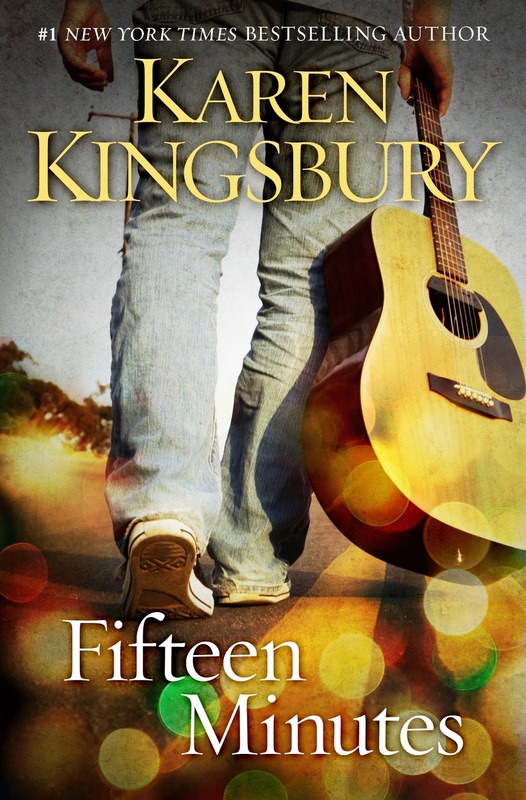 I haven't read many Karen Kingsbury books for a while, but I had been checking this one out and thinking about reading it. When I got a chance to review it, I jumped for it, and am glad I did. I enjoyed the book a lot. So many Christian fiction books center on female characters, and the Christian fiction market is mostly a women's market. This book, though written by a woman, centered on a young man, so admittedly that helped me get into the story more than had it been the usual female lead. And no, I have nothing against female leads in a story, its just easier to relate to a character of the same gender. The plot involves a young Christian guy trying out for an American Idol type competition. I am not at all into American Idol, nor anything close, but it made for a fascinating plot. The story was very entertaining, and I really liked the main character, but it also brought out the dangers of popularity and money for a Christian. I felt Karen gave a great look into what it must be like to be on a show like that, and the affect it can have on anyone, but especially a young guy trying to live a life pleasing to God. Sometimes with a book like this, it can seem a bit unrealistic, but I didn't feel that with this book. Karen took a very ordinary character with a talent, and showed the what it takes to get on a reality vocal show. I walked away having enjoyed a great book, but also with the sober reminder of how easy it is to get off track spiritually, and how even small choices can affect the big picture. I would highly recommend this book. It is definitely worth reading. novelist. There are nearly 20 million copies of her award-winning books in print, including several million copies sold in the past year. Karen has written more than 50 novels, ten of which have hit #1 on national lists. Karen's newest novel, COMING HOME - The Baxter Family - releases June 26 and is the subject of much buzz on Karen's active Facebook page, where she had more than 250,000 friends. There is also great anticipation over THE BRIDGE, Karen's much-anticipated first hardback release with her new publisher - Simon & Schuster's Howard Books. THE BRIDGE is a love story set against the demise of the American bookstore. In addition, Karen has ventured into the area of short pieces with her new non-fiction series - KAREN KINGSBURY, THE REST OF THE STORY. Her first piece, I CAN ONLY IMAGINE, has touched the hearts of tens of thousands of readers interested in knowing more about Karen's personal life and the motivation behind her Life-Changing Fiction (TM). I CAN ONLY IMAGINE shares the story of Karen's brother, his struggles, and his quest for redemption. Karen's novel LIKE DANDELION DUST is the subject of a major motion picture currently in theaters. Like Dandelion Dust stars Academy Award winning Mira Sorvino and Barry Pepper, along with Cole Hauser and Maxwell Perry Cotton. The film has received more than 30 awards in the Film Festival Circuit including numerous Best Picture awards. Several of Karen's books are currently under theatrical development. Karen's most recent series - the Bailey Flanigan Series, wrapped up in March. Coming Home - The Baxter Family - is a stand-alone novel about John Baxter's 70th Birthday and the tragedy that happens during June, 2010 with Take Four. The series is about two producers looking to change the world with the power of film. The Above the Line series also includes Karen's popular characters from the fictitious Baxter Family. The Baxters were first introduced to readers through the five-book Redemption series, and then the five-book Firstborn series, and finally the four-book Sunrise series. 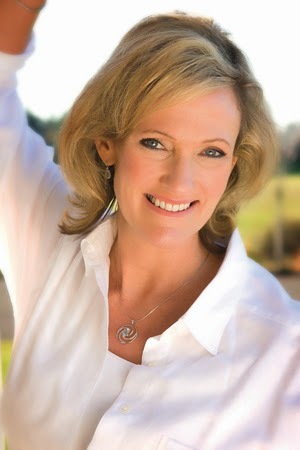 Dubbed by Time Magazine as the Queen of Christian Fiction, Karen has also been a featured guest on the Today Show, Fox News, USA Today, and numerous other television programs and magazines. Her fiction has made her one of the country's favorite storytellers. Others of her emotionally gripping titles include the 9-11 Series, Even Now, Ever After, and Between Sundays. Karen is also a public speaker, reaching more than 100,000 women annually through various national events. Karen and her husband, Don, live in Nashville, TN with their five sons, three of whom are adopted from Haiti. Their daughter Kelsey is an actress who has appeared in several Christian films. She is newly married to Christian recording artist Kyle Kupecky. The two also live in Nashville. Fifteen Minutes is available to purchase from Amazon.com. Note: I received this book as part of the Fifteen Minutes blog tour from Fiction Addict. I received no compensation for this review and only received a copy of the book for review purposes. 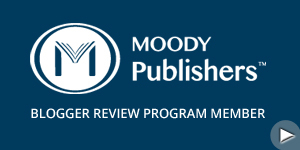 Review copy provided by the publisher.